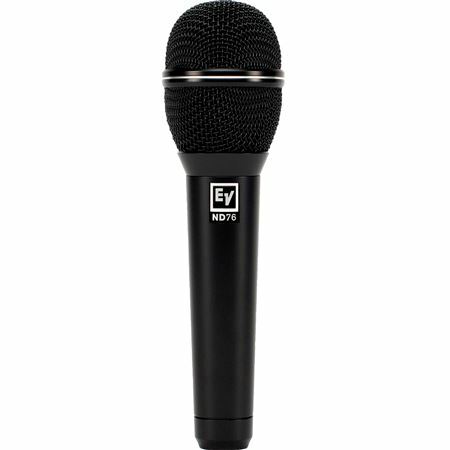 Shop Electro Voice ND76 Dynamic Cardioid Handheld Vocal Microphone from AMS with 0% Interest Payment Plans and Free Shipping. Designed for excellent voice applications, the ND76 is a robust, high-performance dynamic cardioid microphone. The ND76 capsule is precisely tuned to deliver crisp, clear and balanced vocal presence, as well as superior isolation from sound on the stage. The ND76 dynamic capsule contains a large Mylar diaphragm which delivers a rich and detailed frequency response by combining its large surface area for tonal balance with its low-mass high-velocity material for exceptionally fast transient response. The ND76 features an innovative capsule shock-mount system consisting of a 4-point suspension around the circumference of the capsule combined with a tuned pneumatic pump at the capsule base, offering superior handling noise reduction to eliminate mechanical vibrations and noise in the mix. The ND76 capsule uses a humbucking coil that attenuates AC hum and electromagnetic interference. ND dynamic mics can be used with confidence near speaker cabinets and EMF generating equipment racks. The ND76 Memraflex grille is made of a durable tightmesh grille wire that withstands extraordinarily-rough treatment. Your microphone remains protected and looking good gig-after-gig, year-after-year. For additional protection, the ND76 capsule contains a hydrophobic cloth membrane which prevents moisture and debris from reaching the diaphragm. I have owned EV mics for decades. Excellent microphone for the buck! I had been switching between a Sennheiser e935 and Shure 58 for lead female vocals in classic rock band and just not completely happy. Both were a bit scratchy on the high notes (hard to explain exactly but not happy). Went into a competitors store to discuss and they handed me this EV mic for a side by side comparison. Holy smokes what amazing tones!! !- really brought out the mids and bass in my voice and evened out the highs. A clearer, richer sound overall. Very happy! And paying it out CANNOT be beat. Ordered on a Sunday and received Wednesday.